But that can back-fire on us and create discord in friendships. Other types can interpret our “maybes” as commitments, then get upset at us for breaking our word. Or they might recognize that we’re brushing them off and become frustrated by our refusal to give them a direct answer. Our attempts to avoid conflict can actually make things worse. Last week, we talked about one problem that can plague INFJ friendships — the fact that we have a tendency drop out of contact with our friends. It’s fairly easily explained from the INFJ’s perspective, but it can have an unintentional affect of hurting the people around us. Another similar (and in some ways related) problem is our temptation to noncommittally agree with what we think people want to hear, then ignore them and hope they forget about it. When I told someone at college “that sounds nice” in response to her suggesting we get drinks but wouldn’t commit to a time, I did that because I didn’t want to just say, “No, I don’t feel comfortable drinking with you and I’d rather go home and read by myself.” I was scared that would make it hard to work with her on a group project and that she might be offended. She called me out on it, saying, “You know, you can just say ‘no’ if you want.” With that permission, I turned down the invitation and things were fine. When my tow truck driver asked me out, I said, “maybe” because he seemed nice and I didn’t want to just crush him with “no,” but I knew I had no intention of going out with someone I knew nothing about except that he was towing my car away. And then I ignored him when he sent a text saying my car was safely at the mechanic. He took the hint that I didn’t want to stay in contact, but I’d given him hope. And while it was inappropriate of him to put me in that situation, it also wasn’t kind of me to let him think I might be okay with it and then take that hope away. 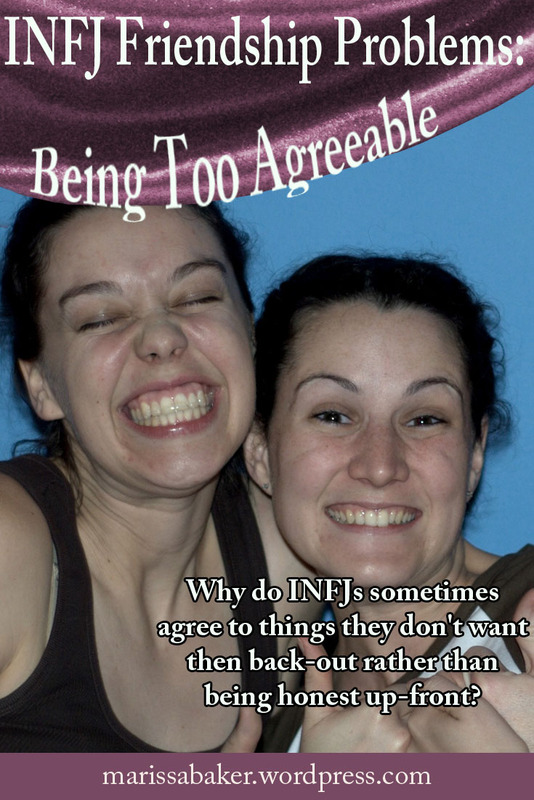 When INFJs verbally commit to things because we think the other person wants us to, it’s partly in an effort be agreeable, but it’s also about conflict avoidance. We don’t want to deal with explaining why we’d rather not do something with the other person. This might have the desired effect of postponing immediate conflict. But it’s not all about sparing the other person’s feelings by agreeing with them. It’s about not wanting to deal with possible conflict and how that will make us feel (we’ll consider how the other person feels, too, but often from the perspective of knowing we’ll have to deal with their emotions on top of ours). Both the examples I used above involved people I didn’t know well — a tow truck driver I’d just met and a classmate who I chatted with sometimes. But INFJ conflict avoidance and agreeability can show up in closer relationships, too. And it’s more of a problem in these relationships. Sometimes, you do have to compromise in friendships to keep both parties happy. 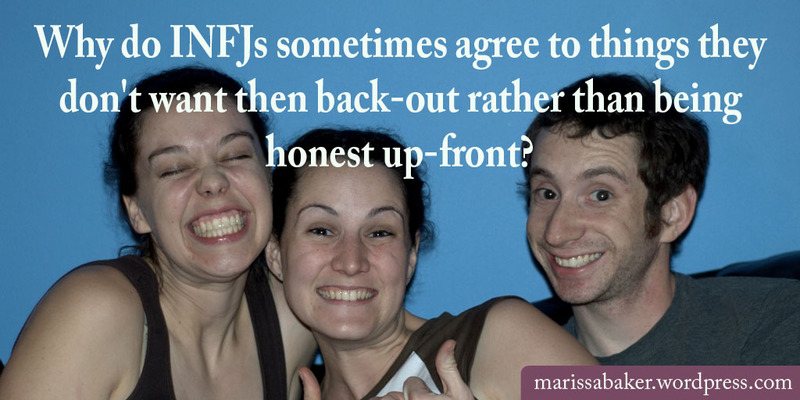 But it should come from a place of mutual understanding and willingness to work together, not the INFJ being scared of honesty. As INFJs, we need to learn how to balance our desire for harmony and our need for boundaries. Here’s a quote from Personality Hacker’s article “Developing The ‘Harmony’ Process As An INFJ.” I highly recommend reading it if you’re an INFJ looking for personal development tips. It’s not easy — believe me, I know. I’ve had my boundaries (mostly emotional ones — I’m better with maintaining physical boundaries and time boundaries) crossed more often than I like to admit. And it’s largely because I don’t clearly communicate my needs and instead mold myself to the other person in the friendship. Picking up on what other people feel and want is an INFJ strength that can quickly turn against us if we don’t learn how to work with it. You don’t have to turn into a disagreeable, conflict-seeking sort of person. But it does help to differentiate between when you want to be agreeable and maintain peace and when you’re doing it because you’re scared or too socially exhausted to try something else. There are times for keeping our thoughts to ourselves and avoiding unnecessary conflict. But there are also times to share what you’re thinking and work-through potential disagreements instead of ignoring them. Giving yourself permission to be honest — about your boundaries, about your thoughts, about what you really want to say to people — doesn’t mean you have to be mean. In fact, our honesty can be a kindness to others as well as ourselves. Be open to saying “yes” to your friends, but also know when to say “no” and let yourself turn them down. It can definitely be a problem. Not with every INFJ and not all the time, but making commitments without wanting to is something many INFJs will do. We don’t really want people to start second-guessing all our commitments, but it is nice to sometimes have a friend challenge us on whether or not it’s what we really want. I’ve really appreciated the friends who’ve taken the time to look me in the eye and clarify what I actually want. That also makes me feel more comfortable sharing my real thoughts with them at other times because I know they won’t get upset at me for being honest.